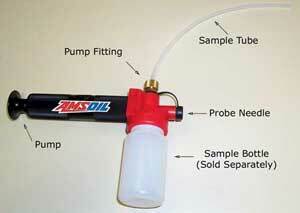 AMSOIL provides oil analysis service options. By analyzing used engine oil, a qualified lab can detect mechanical problems your engine may have. 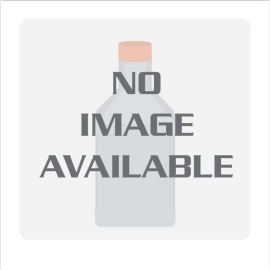 Sold in single kits, cases of 50 and cases of 100. The frequency of sample analysis from your equipment depends on the machine type, machine application and condition, operating environment and other variables. For example, many machines that operate in harsh environments, such as heavy equipment in mining or construction, require short oil sampling intervals - every 100 to 300 operating hours. However, certain power transmission systems, such as gearboxes and hydraulic systems used inside manufacturing and production facilities, require no more than quarterly sampling intervals. The following table lists generic sampling frequencies for common equipment types, and is provided as a guideline only. 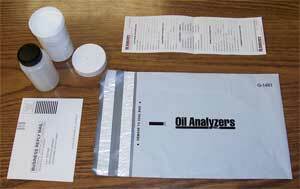 Additional information is available from www.oilanalysis.us, your lubricant supplier, and the equipment manufacturer.